Make no mistake, what is happening in Catalonia is a thuggish and ugly right-wing coup. The full mechanisms of Catalonian government, the police, the transport systems, and rest of the infrastructure has been seized by a militarized state that is transporting armed police and tanks and water cannons across the border. Yet it increasingly looks like a coup that is likely to fail. The widely shared films of crowds sending the Guardia Civil off to Catalonia, with football chants, and la Rojigualda’s being waved triumphantly reveal Spain to be an irrevocably divided ‘Kingdom’. And the tweety-pie boats! Has a military coup ever been so easy to mock on social media? This coup has been launched in the first instance against the Catalonian political class, but it increasingly turning against its real enemy: the popular resistance on the street. The anti-capitalist and anti-fascist left across the different autonomous regions in Spain have for years been telling anyone who would listen that the old remnants of the Francoist state were never completely dismantled in the post-Dictatorship years. And, that those dark forces could easily rise again. Now we know they were right all along. If the mainstream international press do not call it a coup – a situation in which armed guards will almost certainly arrest more politicians and polling officers intimidate voters and block ballot boxes – it is because the political balance in Catalonia is always over-simplified, dismissed as a ‘bourgeois’ revolution, a revolt of the rich periphery against an impoverished ‘PIGS’ state. Add up the GDP sums and there is some sense in this simplification. But the real reason for this coup is that the referendum might just disrupt the old order, it might just disrupt the oligarchy that has remained in place in Spain following the 2008 crisis. The real threat to Spain is the forces in Catalonia that project concrete, workable, alternatives to a political and economic system that sustains a corrupt and bankrupt elite. The real threat to Spain is the mass movement that has gained momentum in its resistance to the coup. It is the left independence movement in Catalonia that must take the credit for pushing and cajoling and ultimately forcing the centrists and a large section of the business and political elites to this decisive moment. Would there be any possibility of a referendum happening on Sunday without the shrewd agitation – inside and outside the Catalonian parliament – of the largest left party in the regional parliament, the Popular Unity Candidacy (CUP)? It is the ten CUP MPs that have constantly harassed and embarrassed the centre into action. Indeed, official support for this referendum was initiated by CUP last year secured only after the Catalonian government finally agreed a deal in parliament. Outside parliament, it is the broad front of the left independence movement that has organized and nurtured the possibility of an alternative politics in their communities. Most importantly, it is this movement that seeks independence on one condition: that the old oppressive order – the rule of elites – must go. This movement is not simply demanding a new ‘nation’ under the Senyera. 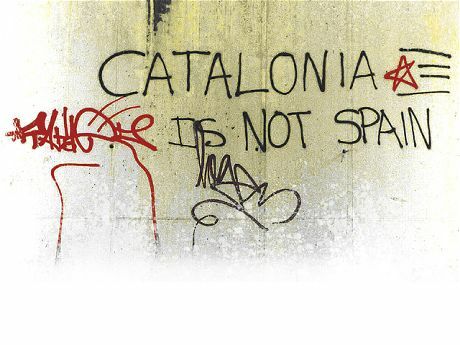 It is not demanding that institutions of government, of law and of economy are reformed to establish some kind of new ‘Catalonian’ cultural sensibility. This movement is demanding that the old order and the old institutions must be replaced by ways of living and working that are not oppressive, are not crisis-ridden and do not sow the seeds of yet another right wing coup. That is what they mean when they say the referendum can only be the key that opens the lock. For those authors, this is not a hypothetical or abstract point. Most of them have been involved in developing a new model of political organising and acting in the large number towns and cities that have been implementing various forms of municipal socialism across Catalonia. In addition to Barcelona en Comu, the CUP has 14 mayors in councils across Catalonia that work on a model of participative democracy and act on the decisions of regularly held local popular assemblies. The same activists are, as I write this, establishing “Committees in Defense of the Referendum” in the neighborhoods, modeled on the Cuban “Committees in Defense of the Revolution” to provide an ongoing model of participative democracy that outlives the referendum and gives people a chance of building new institutions and new forms of organising. If the referendum takes place on Sunday, it will be because the community-based left in the independence movement has seen it over the finishing line. But this movement will not be content with putting a cross on a reclaimed ballot paper. This counter-coup is planting the seeds of alternative ways of living, of working and of finding real independence. Good luck with that, David…. What are you proposing? A violent revolution? Of course you are absolutely right Redgauntlet, Spain will not agree, and the most likely scenario is a major impasse over the next few days. A violent response by the demonstrators is likely to would play into the hands of the Guardia Civil and Spain. The coup has a parallel aim: to prevent the referendum of course, but increasingly it will seek to provoke violent confrontation with left and neighbourhood activists in order to split them from the centrist movement. The protests have, so far, not been provoked and have been exceptionally restrained and disciplined. Spain might well be able to assert control again regardless of what happens on Monday, but it is by no means clear at the moment, and more importantly the momentum and the accumulated experience of this level of collective resistance cannot be easily eradicated. Violent revolution? That is a fantasy. The resistance is strongest in the roots of an alternative social and political order that been sown patiently over the past few years by en Comu and CUP and by the remarkably developed level of local neighbourhood organisation and the co-op economy that flourishes in Catalonia. The real threat to the Spanish oligarchy is that his will continue to grow no matter the outcome on Sunday. Couldn’t agree more with your comments about the SNP, Kenny. They have lost vision and now, and as the dominant party in Scotland, at least for the time being, they tread the boards with their elected representives picking up well paid sinecures. Gone is any trace of fire in the bellies. Gone is the sharp policies characterised by the Salmon years. Paid by English gold I am sadly afraid to say. When were the Salmon years? The argument is that democratic change begins and ends with how people organise in their communities. The Scottish Tories have taken a stance of saying ‘we’ve had enough of your democracy, now hold yer wheesht’. To some extent, with media backing, in particular the anti-SNP BBC, people have been silenced, but now is the time to prepare.. the absence of a political process to deliver Scottish independence should be the cue for people to focus on preparing for the crisis that will precipitate independence. In Catalonia, the independence movement is varied and highly developed. By organising the referendum in the face of Madrid hostility, the Catalans have proved their right to self-determination. The coming declaration of independence will only serve to make the edicts from Rajoy and the Spanish courts appear even more irrelevant.